The U.S. Coast Guard is responsible for investigating accidents on coastal and inland waters and compiling the associated accident statistics. 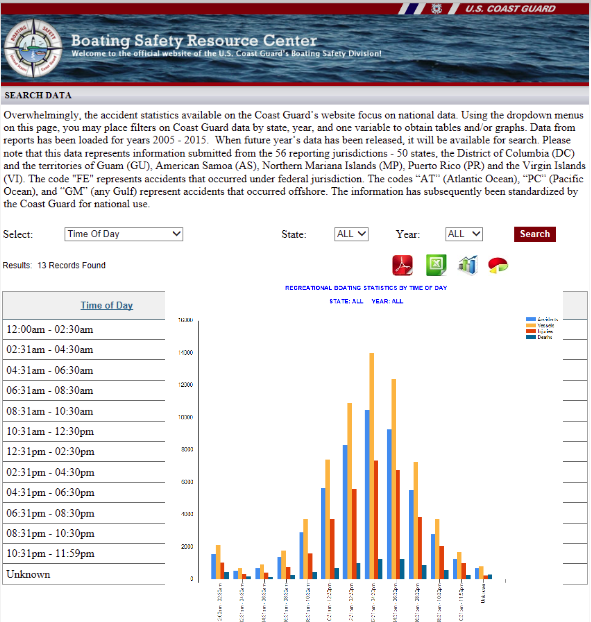 The USCG Boating Safety Resource Center has an online query tool for users to search and filter recreational boating accident statistics by location, year, and accident attributes such as type of vessel or body of water. The available statistics cover 56 reporting jurisdictions (states and territories) for the years 2005-2015. Users can download their search results or take advantage of the chart creation features included on the website.